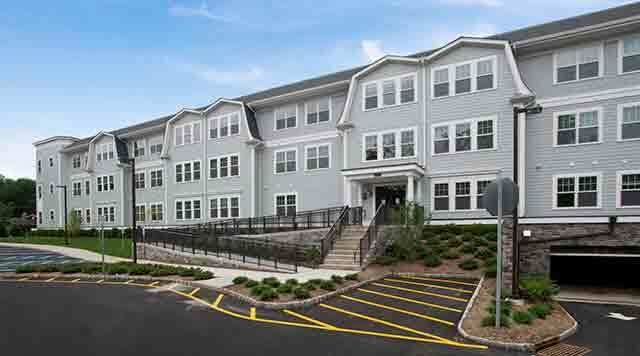 FRANKLIN LAKES, NJ – Colonial Pointe’s first tenants are now enjoying their new homes at the high-tech rental community in Franklin Lakes. The building received its certificate of occupancy on July 29th, and over 30 percent of its apartments are now leased. Located on Colonial Road, the energy-efficient community features 87 one- and two-bedroom residences with dens in select apartment designs. All apartments features nine-foot ceilings, quality plank flooring and carpeting, in-unit laundry and gourmet kitchens with quartz countertops and stainless steel appliances. Colonial Pointe offers a fitness center with state-of-the-art cardio equipment and individual TV’s, as well as an indoor lounge with a flat-screen LED TV, Starbucks machine, wet bar and upscale furnishings reminiscent of a high-end hotel. Outdoor amenities include a 1,500-square-foot upper level patio that features lounge chair seating, and a 2,000-square-foot downstairs space with picnic tables for outdoor dining. The community is convenient to shopping at Garden State Plaza, entertainment at Meadowlands Sports Complex and outdoor recreation at Ramapo Mountain State Forest. Commuters enjoy easy access to Routes 287, 208, 17 and 80, the Garden State Parkway, NJ Turnpike, George Washington Bridge and NJ Transit bus and rail service. To schedule an appointment, call 201-904-2124. Those interested are encouraged to visit ColonialPointeFranklinLakes.com to sign up to become a Colonial Pointe VIP and receive the latest updates about this high-tech community.